Well hello, Warhawks. It’s that time of year again where a select few of us will be taking that walk across that stage in May. It has been a long path to get to this moment and you want to savory every second of it. Well, as we all know pictures can be a crucial aspect of that important day and the days leading up to commencement. 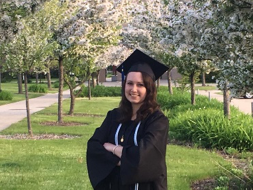 I am here to tell you the best places to take your graduation photos at UW-W either on the day of commencement or after you receive your cap and gown. No matter what your major is, you may have a personal preference for an academic building here on campus, which perfectly alright. 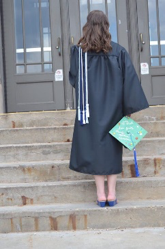 You may have spent the last four years studying, testing, making friends, or even napping in those building and you want to have them in your pictures. The issue that you could run into is that some of the buildings may not be the most photogenic, but I am here to give you the areas for each building that will give you the best angle. Let’s start with Hyland. There are some places outside of the building and inside that will serve as the optimal places to take those “lit” pictures. As you can see from the picture, the front of Hyland offers a stoop to sit on and the backdrop is stunning. The next area in Hyland would be to go to the fourth floor of Hyland, take the elevator so you are not sweaty once you get there, and do some poses along the railing so that you can capture the mural on the wall and possibly a sunset. The next building would be Upham, and for this one it would be picturesque to do a picture or two in the courtyard of Upham on the west side of the building. Next, would be to use the staircase that leads to nowhere except to an amazing looking photo. 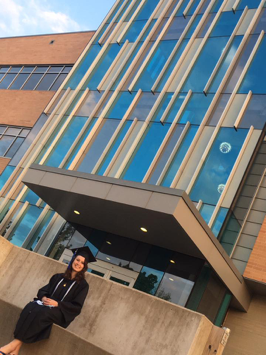 The next building to go to for those perfect angles would be Winther, which by the time you get your cap and gown, campus will be blooming with beautiful flowers and other plants offering an amazing backdrop. Feel free to utilize the bench in the front of the building or the ramp that allows for you to stand behind the flowering plants so that you can get a nature picture that will get all the likes on the Instagram. The large open space offers you the opportunities to get every angle you want to get in front of that amazing building. Our gaze now switches to Heide, which may seem hard to take pictures in front of, but it takes a special eye to see the potential this building has to offer for pictures. Just like with Hyland, you will need someone to get down low to get that angle and get the building sign in the picture, so you can remember where you spent a lot of time when you were here. There is also a beautiful tree that grows outside of the building which would be good to include if you’re trying to get a more nature-centered picture. 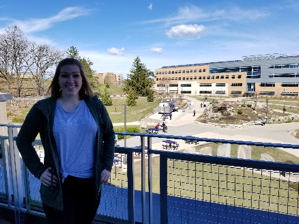 The last academic building that must be mentioned is the CA(Center of the Arts), which not only offers a beautiful backdrop, but also offers different spaces around it that will allow for the like button on your social media to explode. The south side of the building features a piece of art that has a range of bright and vibrant colors which will make you pop in the photo. The inside of the building has a couple of different areas to take beautiful pictures, but the atrium is the main area to focus on when it comes to picture taking because of all of the different sitting locations to create a variety of pictures to capture all your favorite memories. The University Center offers a range of different locations and backdrops for you to make sure you can find all the right lighting and angles. The balcony located on the second floor overlooks the mall and fountain, which if you are leaning on the railing will make for an amazing photograph. The south-side of the mall in the court will also be a suitable place to take some photos because of the many options for beautiful angles and backdrops, such as the arch at the top of the building and the beautiful flowering plants in the ring. Also, don’t forget about Willie’s bench in the UC which is located across from Einstein’s. The fountain (Minneiska Springs) is the centerpiece of UW-W and offers a wide range of different background, such as the waterfalls on both sides of the structure, the multitude of flowering plants on the mound, and the beautiful stones which lines the entirety of it. once the flowers start blooming around the fountain, this area should be your first choice for those lit pictures you are looking to take for graduation. As mentioned before, there are a couple of locations located on the outside of the CA that can serve as the perfect places to take those amazing pictures. I have found from personal experience that there is a lane of flowering trees that can be used for different angles or different poses for your pictures. There are also different trees on the hills around the building that if the light hits them just right, will make from some interesting color effects to be created. 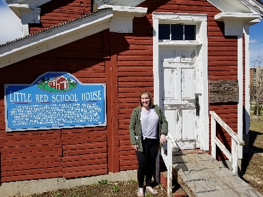 Speaking of the hills around the CA, it is important not to forget the historic buildings and gardens that are in the hills of Whitewater, such as the Little Red School House, the Log Cabin and the Campus Memory Garden. The school house could be a fun idea for you because you could pose like it’s the first day of school again. 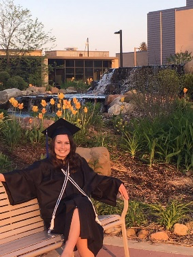 Also, the Memory Garden is a beautiful location from the flowers that bloom, to the old pillars that used to be a part of Old Main (Hyer Hall) which campus puts tassels on for commencement, to the giant purple chair for that fun photo you want to take. These locations are easily accessible and once the flowers start blooming, you will regret not stopping at one of these locations the day you graduate. 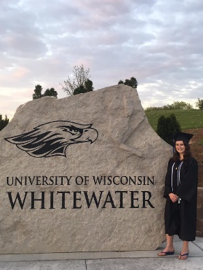 The last location on campus that you will not want to forget to get a photo with is one of the large stone UW-Whitewater logo rocks around campus. The primary one that most of you probably have seen at least once in the past four years is located by Perkins and it makes for a memorable photo that you may even consider making a profile picture after you graduate. You have worked very hard to get to this point, and you deserve to take away as many memories as you want from this experience. You have met new friends, made life-long connections, and earned an education that will help you in the future in whatever you decide to do. I am excited to walk across that stage in May and I look forward to seeing you there. Finish this semester strong, Warhawks and we can all relax once this part of the journey is over.